This weeks challenge at Just Add Ink is a colour challenge. At first I was a little hesitant about the colour choices...none of my favourite Designer Series Papers came in these colours so I was a little stumped until I discovered a sheet of Bella Bleu paper that had a soft yellow swirl on it. When I sponged this paper with More Mustard Ink I was delighted with the effect it produced and that became the pleated feature of my layout. For the script flowers, I stamped onto the Bella Bleu DSP with the En Francais Background stamp in Basic Gray ink. I then punched out scalloped circles and scrunched them before adding to my layout. I was inspired by the vintage book paper I have seen used elsewhere but I wanted a more scrapbook friendly version. 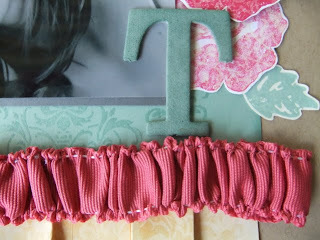 The double stitched ribbon makes it so easy to create a ruffled look on your page. I have just pulled the stitching tight and secured at the back of the ribbon. Here is a closeup of the sponged DSP. I was so happy with how this looked. I can't wait to try it out again on some of my least favourite papers. Photo credits for the gorgeous photo of my niece Tammisha go to my sister-in-law Shelley Wendt. She takes the most amazing photos. WOW this is really pretty! I love all the gorgeous touches you've add - and its just enough! PERFECT! This is an AMAZING page! I love how you've done the ribbon (and thanks for the tip! ), and the pleated DSP looks gorgeous. And what a beautiful photo you had to work with! I'm off to explore your blog now, thanks for playing! 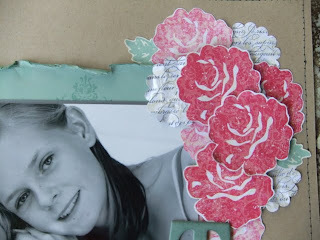 This is lovely Lisa, love all the different elements you used to scrap your page. 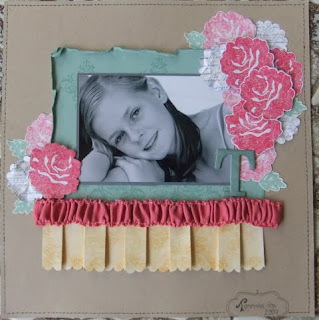 I'm in awe of the detail and creativity that this gorgeous scrapbook page displays! 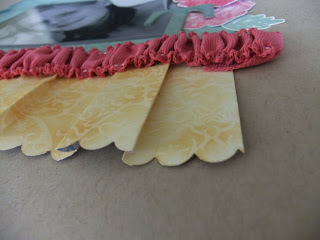 Just love the idea of sponging more mustard onto the DSP and gathering your double stitched ribbon!! Wow! and Wow! 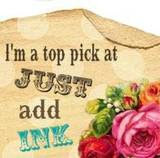 I find scrapbooking a challange in its self never lone be limited to colour you have done a fantastic job Lisa! This, Lisa Johnston, is STUNNING!! I adore what you've done with the sponged DSP. All of the elements of your layout are just beautiful; fantastic job with the challenge. Absolutely gorgeous! I love the ribbon detail. Fabulous idea! This layout is gorgeous!! I love the way you have ruffled the ribbon and the scallop detail under the ribbon is very pretty. I love how you've ruffled the ribbon I will definately be giving this a go! This is a beautiful scrapbook page. Wow! This is beautiful! So many different aspects and it still looks simple and elegant. Fantastic! This is lovely - especially the ruffled ribbon & pleats! Congrats on being a top pick! !